Stacey Tull, MD and Saadia Lakhany Raza, MD, co-chairs of the St. Louis outreach, (3rd and 4th from left) assembled an incredible team of local volunteers who enthusiastically reached out to the receptive and appreciative crowds. 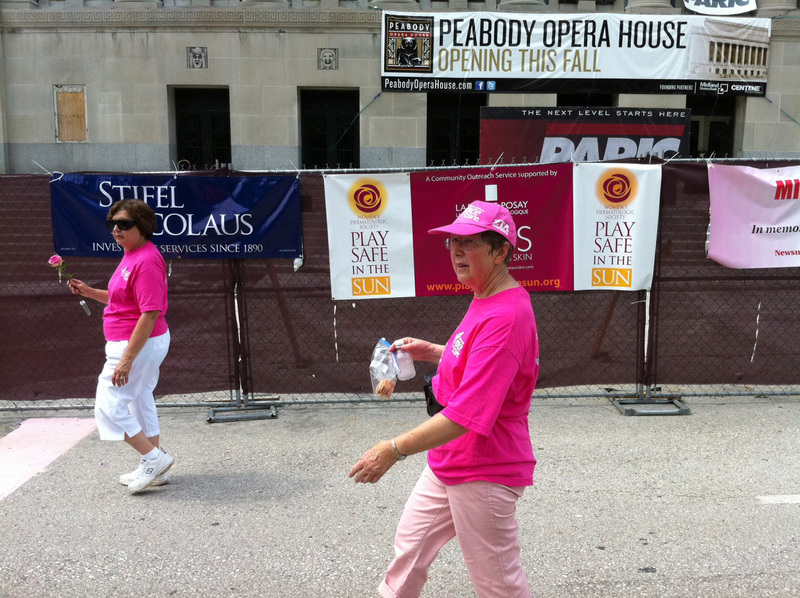 (Alexandria, VAJune 23, 2011)--In an important milestone for the Women's Dermatologic Society (WDS) and its award-winning skin cancer prevention and sun safety campaign, Play Safe in the Sun, Greater St. Louis volunteers reached out to the breast cancer awareness community for the first time since the outreach began in 2004 by participating in the downtown's recent Susan G. Komen Race for the Cure ®. The expanded focus was prompted by data indicating that breast cancer patients and melanoma patients alike face higher chances of developing the other form of cancer in their lifetimes. Play Safe in the Sun is a community service program supported by a generous three-year grant from La Roche-Posay and its public initiative, SOSSave Our Skin. 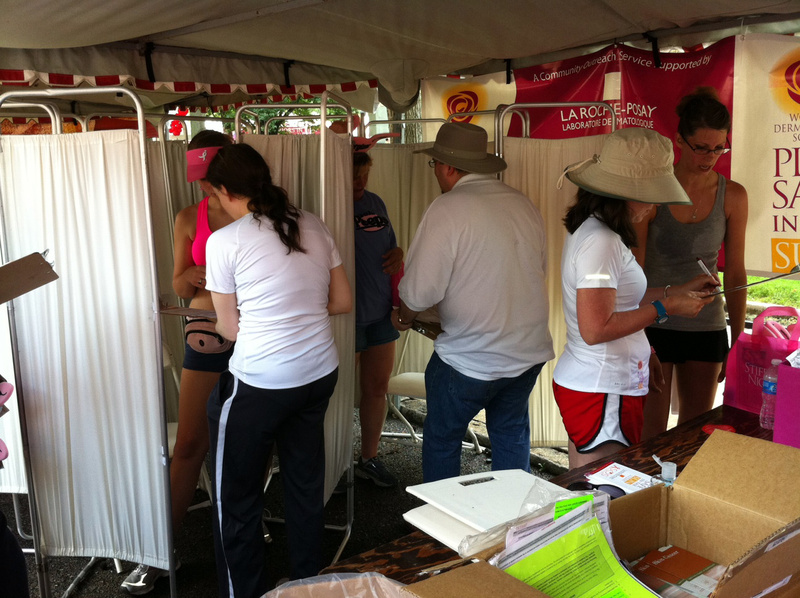 Traditionally, the outreach has provided free skin cancer screenings, sun damage assessments and sun safety education at large-scale outdoor sports and family events. 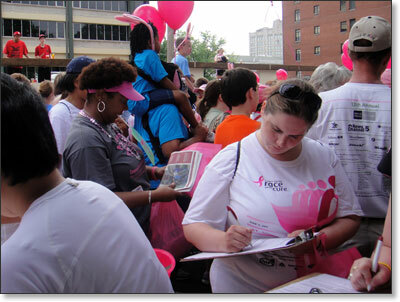 WDS President Diane S. Berson, MD (2011-2012) notes,"Participation in this event marks a turning point in the evolution of the WDS public outreach service." Yannick Raynaud, General Manager of La Roche-Posay adds,"We are very proud to support the efforts of WDS members as they reached such an important population with the message of sun safety." The St. Louis volunteer effort was led by co-chairs Saadia Lakhany Raza, MD and Stacey Tull, MD, both board-certified dermatologists from the Skin Surgery Center of Missouri in O'Fallon. Local physicians provided 114 free skin cancer screenings to the public, referring 34% of the individuals screened to dermatologists for further diagnosis/biopsy of suspicious sites on the skin that were presumptively diagnosed as skin cancers or pre-cancers. 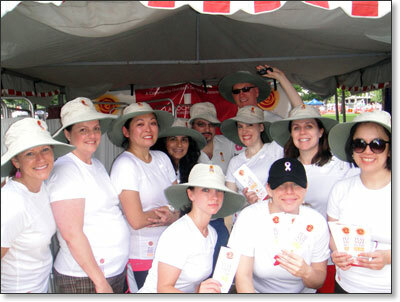 In addition, volunteers offered sun safety education and 11,000 samples of sunscreen to event participants. 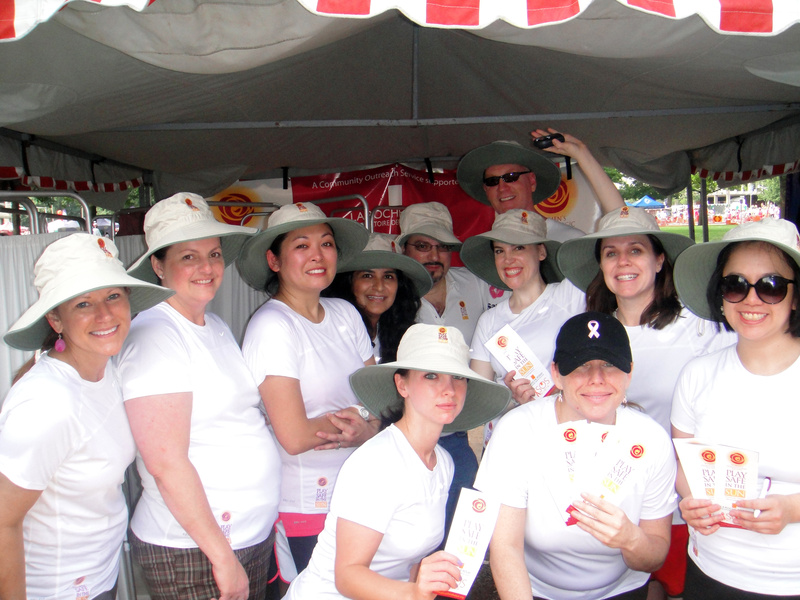 Comments Dr. Raza,"With such huge crowds of people representing all ages, all skin types and all walks of life, our local volunteer team was so pleased to have had the opportunity to promote skin cancer prevention and sun safety at such a popular community event." 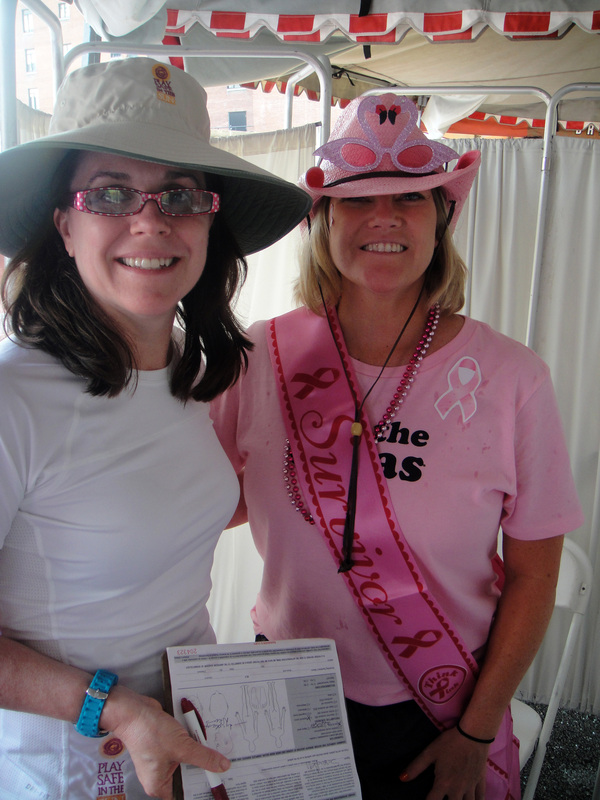 For the breast cancer community, this message was especially important, adds co-chair Dr. Tull,"in light of data showing that breast cancer patients face a higher lifetime risk of developing melanoma, and similarly, melanoma patients face a higher risk of developing breast cancer." Board-certified Missouri dermatologists who volunteered included: Melinda Chu, MD, Dee Ann Glaser, MD, Mary Guo, MD, Joe Muccini, MD, Saadia Lakhany Raza, MD, Michelle Tarbox, MD and Stacey Tull, MD. Additional volunteer support was provided by: Daphne Marre, Patricia Moffett, Carol Neuwirth, Melissa Tucker and Everett Ansel. 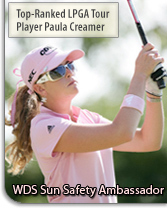 The Women's Dermatologic Society supports the careers and professional development of women dermatologists. Our mission is to help women in dermatology achieve their greatest potential by striving to foster, promote, and support women's issues in dermatology; identify, train, and recognize women leaders in dermatology; provide a forum for developing relationships and the exchange of ideas and research relevant to women's issues; and promote the highest possible standards of ethics, research, patient care and education, and public education. Recommended by more than 25,000 dermatologists worldwide, La Roche-Posay offers a unique range of daily skincare developed with dermatologists to meet their standards in efficacy, tolerance and elegant textures for increased compliance. The products, which are developed using a strict formulation charter, include a minimal number of ingredients to reduce side effects and reactivity and are formulated with active ingredients at optimal concentrations for increased efficacy. Additionally, every La Roche-Posay product undergoes stringent clinical testing to guarantee efficacy and safety, even on the most sensitive skin. As a leader in high UVA protection, La Roche-Posay Anthelios sunscreens provide advanced patented sunscreen technologies, including Mexoryl SX and CELL-OX ShieldTM, with broad-spectrum protection and high photostability in revolutionary textures. La Roche-Posay products can be purchased at select physicians' offices, CVS/pharmacy, Walgreens and Duane Reade locations, and online at www.larocheposay.us. To learn more about La Roche-Posay products, please contact Julie Kofman, Creative Media Marketing at 212.979.8884 or Julie@cmmpr.com. 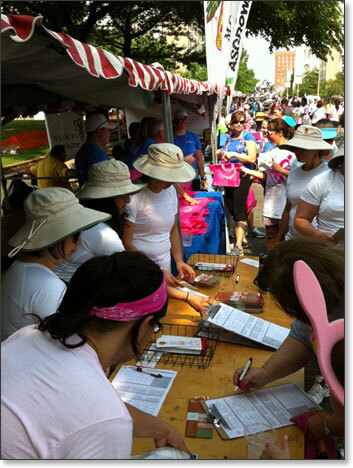 Huge crowds flocked to the WDS Play Safe in the Sun booth for skin cancer screenings and free sunscreen. 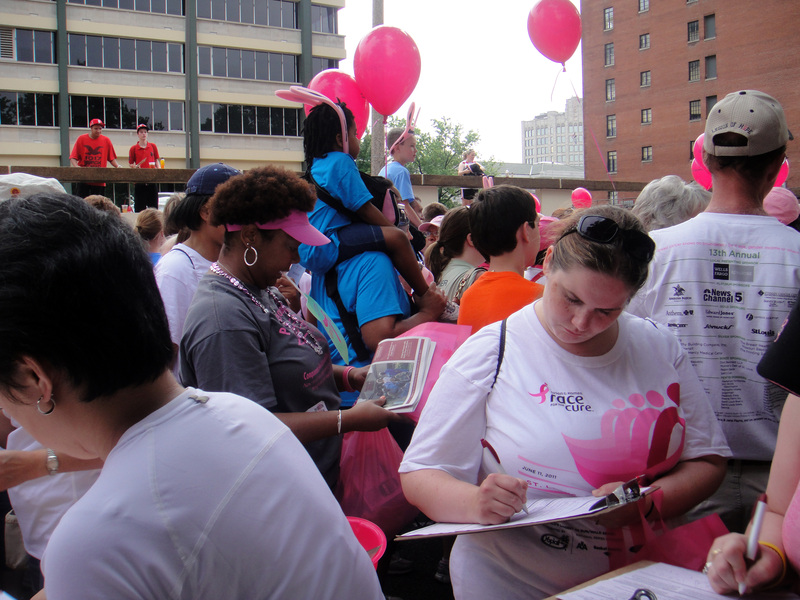 Thousands of breast cancer survivors proudly passed the finish line at this major Susan G. Komen Race for the Cure ® event in St. Louis. 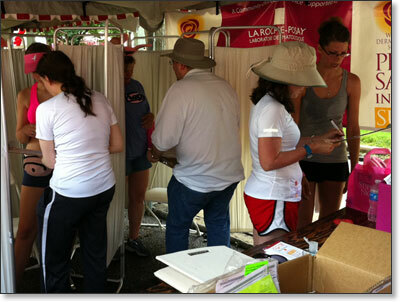 The participants were very grateful for the free skin cancer screenings and La Roche-Posay sunscreen provided by WDS volunteers. 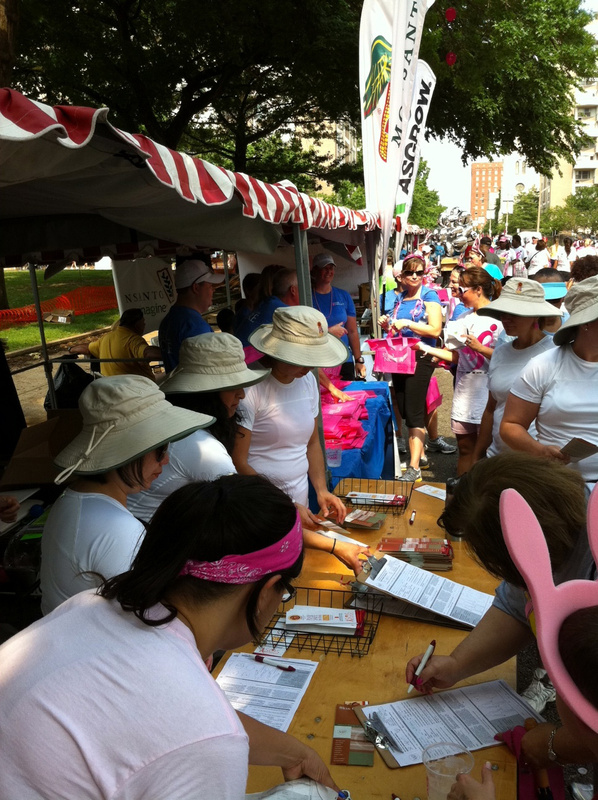 65,000 people participated in the recent Susan G. Komen Race for the Cure ®, which is considered one of the world's largest gatherings for this cause. 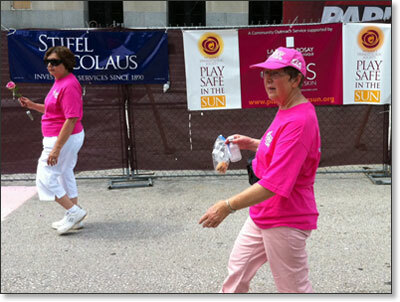 Our first-time presence at this major event was an important milestone for the WDS Play Safe in the Sun Campaign. 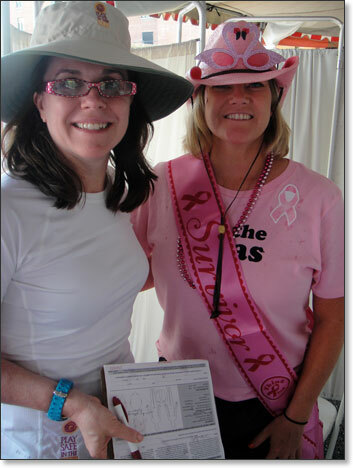 Dee Anne Glaser, MD is pictured with a local breast cancer survivor during the WDS Play Safe in the Sun skin cancer screenings at the Susan G. Komen Race for the Cure ® in June 2011, held in downtown St. Louis.